Browse > Home / County of Los Angeles, East Los Angeles (LA City), Eastside Sun, General News / There’s a New Sheriff’s Captain in East L.A.
There’s a New Sheriff’s Captain in East L.A.
After about 11 years with the same captain at its helm, the East Los Angeles Sheriffs Station is undergoing a change in leadership. Capt. James P. Wolak has replaced Capt. Henry M. Romero, who was the ranking officer at the station since 2001. Romero was promoted to commander and now oversees an entire region. 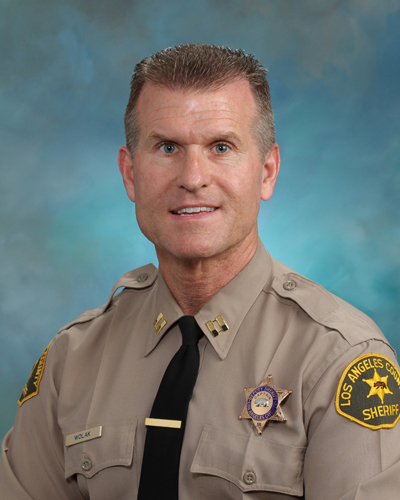 Wolak, a 23-year-veteran of the Los Angeles County Sheriff’s Department, was promoted by Sheriff Lee Baca and assigned to the East Los Angeles Station in October. Though Wolak has never worked in the East LA Station jurisdiction, composed of predominantly Latino majority communities, he said he is a certified by the Sheriff’s Dept. as a bilingual Spanish-speaker. The East Los Angeles Station polices unincorporated East Los Angeles and the cities of Commerce, Cudahy and Maywood. “I look forward to partnering with the residents and the school district to ensure the community is the safest in the County,” Wolak told EGP in an email, responding to a question asking how he feels about his new assignment. Wolak joined the Sheriff’s Department in 1989 and his previous assignments include the Men’s Central Jail, Lakewood Station, and the Recruit Training Unit. As a sergeant, Wolak worked at Temple Station and in the Personnel Unit. And as a lieutenant, he was watch commander at Norwalk Station, Service Area Lieutenant in the city of Paramount, Operations Lieutenant at Industry Station and executive aide to the Undersheriff. Wolak has a Bachelor of Science Degree in Political Science from Cal Poly Pomona and a Master’s Degree in Organizational Leadership from Woodbury University. He was born in Pittsburgh, Pennsylvania, is married and has four children. Romero is now assigned to the Sheriff’s Field Operations Region 3, which includes the East Los Angeles area in addition to Cerritos, Industry, Lakewood, Norwalk, Pico Rivera, San Dimas, and Walnut, according to Sgt. Rich Peña of the Sheriff’s Headquarters Bureau. December 6, 2012 Copyright © 2012 Eastern Group Publications, Inc.